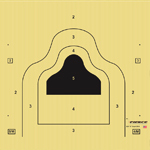 Our Military Rifle Targets are pre-printed on 72” x 72” 4 mil ivory Bullet Seal™ plastic. The targets are weather proof and durable in any climate. By using these 1-piece targets with the Bullet Seal™ 6 x 6 self-healing frame, you will be shooting in minutes. 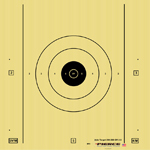 The Baker 500 target is pre-printed on 72" x 72" 4 mil ivory Bullet Seal™ plastic. The 5V target is fired at 500 yards away. 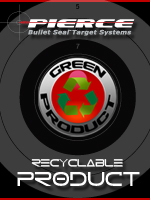 The ELR "D" target is pre-printed on 72" x 72" 4 mil ivory Bullet Seal™plastic. 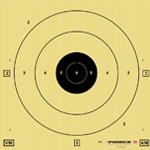 The "D" Mod target is fired on during the 200 and 300 yard rapid-fire stages. 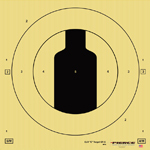 The ELR "E" target is pre-printed on 72" x 72" 4 mil ivory Bullet Seal™plastic. The "E" silhouette target is fired on during the 500-yard slow fire stage.